The Florence Area Chamber of Commerce is kicking off its annual Holiday Festival on Saturday, November 24. 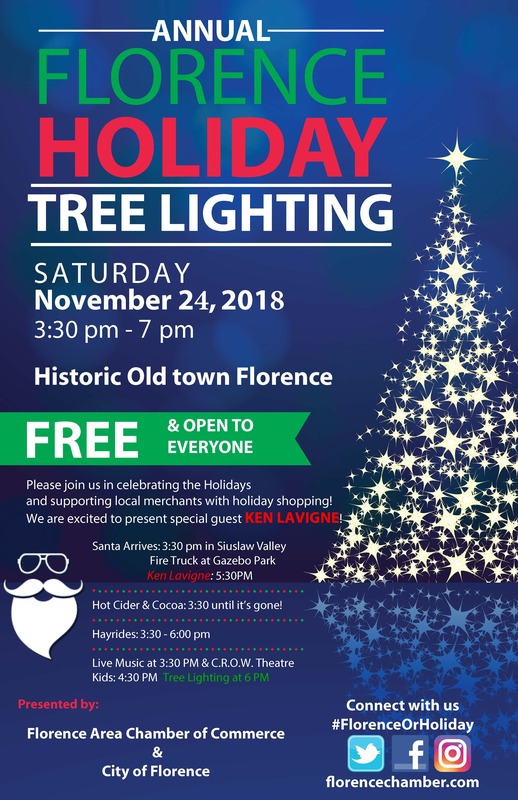 Santa’s arrival, hayrides, lighted boats at the marina, live music, and other performances, and the official lighting of its Christmas tree will take place in Historic Old Town; and shops and galleries will be open for holiday shopping all around town. Beginning at 3:30 p.m. the public can enjoy hot cider and cocoa, hayrides down Bay Street between the Port of Siuslaw and the parking lot west of The River House Inn, live music, and witness Santa’s arrival via firetruck courtesy of Siuslaw Valley Fire and Rescue. C.R.O.W. Theater Kids will perform at 4:30 p.m. Nationally-touring swinging crooner Ken Lavigne performs from 5:30 to 6:00, and at 6:00 p.m. everyone can gather at the Siuslaw Interpretive Park when Mayor Joe Henry flips the switch to light the tree. Lavigne will perform a full concert of Christmas standards at the Florence Events Center, 715 Quince St., at 7:00 p.m. Tickets are $35. Returning this year is the “Light Up Your Boat Float” at the Port of Siuslaw docks in Old Town. Boat owners—of anything from kayaks to superyachts—are encouraged to bring their boats, decorate them for the holidays, and be part of the festivities. Participants can moor their boats overnight on November 24 for free to be part of the event, but they must register with the Port, 541-997-3040, before Tuesday, November 20. The Chamber will award a trophy for the best decorated vessel. In addition, the local Coast Guard station will dock one of their vessels as part of the festivities. Saturday is also national Small Business Saturday day in honor of supporting small business in America. For more information call the Florence Area Chamber of Commerce at 541-997-3128, visit FlorenceChamber.com, or check their Facebook page at Florence Oregon Coast.